"An immersive play-by-play of the company's ascent.... It's hard to imagine a better retelling of the Amazon origin story." -- Laura Bennett, New Republic Amazon.com's visionary founder, Jeff Bezos, wasn't content with being a bookseller. He wanted Amazon to become the everything store, offering limitless selection and seductive convenience at disruptively low prices. To do so, he developed a corporate culture of relentless ambition and secrecy that's never been cracked. Until now. Brad Stone enjoyed unprecedented access to current and former Amazon employees and Bezos family members, and his book is the first in-depth, fly-on-the-wall account of life at Amazon. 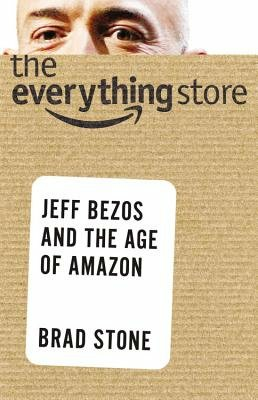 The Everything Store is the book that the business world can't stop talking about, the revealing, definitive biography of the company that placed one of the first and largest bets on the Internet and forever changed the way we shop and read. Biographers (and book reviewers) are always doomed to oversimplify their subject. But through hundreds of interviews and years of covering the company as a journalist, Stone - a senior writer for Bloomberg Businessweek in San Francisco - does a pretty good job capturing Amazon's meteoric rise.... "The Everything Store" does offer absorbing management insights, and any businessperson will go to school on Bezos' well-documented negotiation tactics. Insiders will get a serious glimpse at an industry behemoth. Economic libertarians will find a poster child (if they hadn't already) in Bezos. And Prime members will certainly have echoes of colorful anecdotes the next time they're shopping. ...[an] engrossing chronicle... Stone obviously admires his subject, but it's hard to tell if he likes him. For that matter, it's hard to tell if anybody likes him.... Stone does know when to provide a breather with entertaining anecdotes about Amazon's competitive jujitsu. Mr. Stone, a senior writer for Bloomberg Businessweek and a former reporter for The New York Times, tells this story of disruptive innovation with authority and verve, and lots of well-informed reporting.... The Everything Store does not examine in detail the fallout that Amazon's rise has had on book publishing and on independent bookstores, but Mr. Stone does a nimble job of situating the company's evolution within the wider retail landscape and within the technological revolution that was remaking the world at the turn of the millennium.